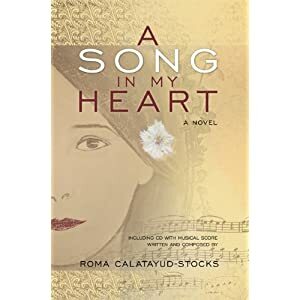 Author and Songwriter, Roma Calatayud-Stocks will be signing her award-winning historical novel, A Song In My Heart, including CD with original musical score, at the Mom’s Choice Award booth at Book Expo America on June 6, 2012 – 3:00p.m. (Booth # 2267-2268) The book received the award in the Multimedia Experiences category, as well as recipient of a 2012 Midwest Book Award in the Arts category, and Finalist in several other book award competitions and categories including Historical, Multicultural, Romance, and Cross-Genre Fiction (International Book Awards). A Song in My Heart is an in-depth exploration of character, celebration of art and culture, and a musical journey. KirKus Reviews: "Well-written, the story is compelling . . . this novel deserves to find a larger audience. The historical aspect is well researched and true to the period. The novel’s grand ambitions are evident in its packaging—it is both book and musical composition (CD included). The author intends this to be the first in a trilogy, and she has created enough momentum to build on. An auspicious debut." Jim Barnes, Editor, www.IndependentPublisher.com: "Reading this book will put a song in your heart, and take you back to a time when classical music was the pinnacle of popular culture and entertainment. A talented composer herself, author Calatayud-Stocks shares her knowledge and passion for art and music with this compelling historical novel and accompanying original soundtrack CD. How refreshing this is-longing for a world of fine art and music with substance? A Song in My Heart is a great place to start." Chan Poling, Emmy award-winning composer: "I have arranged and played many styles of music over the years. Roma's music has touched me always. Her new collection of songs for her story, A Song In My Heart, are once again beautiful and lushly romantic, evocative of another time and place." A Song in My Heart introduces us to Alejandra Stanford, the protagonist born into a privileged bi-cultural family in Minneapolis of 1902. Growing up, she and her artistic family experience the intermingling of American, Hispanic, and European cultural influences, as well as national events that challenge their lives; yet, Alejandra finds that music is the perfect expression of her own artistic inclinations, emotions, and ambitions. As a young pianist and budding composer, “Ale” is inspired by legendary composers and resolves to become a symphonic conductor despite the obstacles. John Watson Milton, Award-Winning Author: “Calatayud-Stocks takes the reader on a compelling journey, from Minnesota and New York to México and across the continent of Europe, spicing her narrative with details that speak to her own powers of observation. It is a sparkling account, and we look forward to the sequel that is sure to follow. I enjoyed it immensely." Author and songwriter Roma Calatayud-Stocks holds bachelor and master's degrees from the University of Minnesota. After additional studies at the University of St. Thomas, and in line with her twenty-year work experience and life passion of honoring world cultures through history, music, and the arts, she turned to a professional career in music composition and historical fiction writing. Ms. Roma Calatayud-Stocks is available for interviews, speaking engagements, and Arts Educational workshops on: Music history, Classical, Popular, Latin Music, Cultures, Music, Art and Traditions from Around the World, and Writing Historical Fiction.